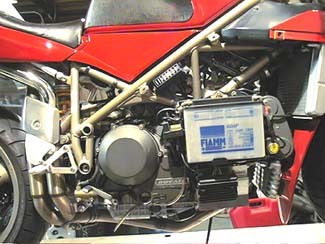 The Ducati factory manual is quite useful for the desmoquattro Superbikes unlike the manual for the desmodue Supersports. And now, Haynes has a maintenance manual available for `94-`01 Superbikes ... it's available for $23 in hardback from www.ca-cycleworks.com. Unlike most sportbikes with fairings, it is quite easy to remove the fairings on the Superbike. Just a few dzus fasteners and the two main fairings are gone. A few screws and the front fairing goes, too. 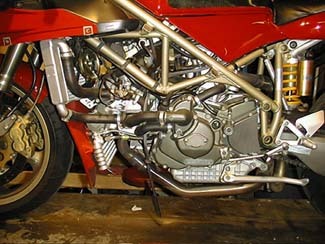 The real headache involves removing the tail section so the airbox can be removed. The Karbacher aftermarket seat doesn't allow the tail section to be lifted fully due to the raised front lip. Be sure that your dealer actually checks the rocker arms for wear when they do valve adjustments on your 4 valver. Apparently, the factory decided to ship many rockers with only .004" of hardfacing on them. These wear out pretty quickly. I did my first valve adjustment on my 916 at 10500 miles and 5 rockers were ruined. Read about it and see pics here. Please note that the pics are kinda large - be patient if you don't have a high speed connection. Superbikes also have an issue with the belt tensioner locknuts. It seems that not all dealers or mechanics replace the lock muts with every use. 6mm locking flange nuts are available via any fastener supply house for a reasonable cost. There is no excuse for one of these to work loose and alter your timing because your maintenance guy is lazy. It's kind of a bear getting in there to set and lock the 4V belt tensioners, especially since the rear cylinder is behind the frame. 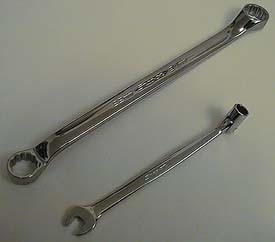 There are two tools that nicely do the job: Snap-On's FHOM12 and XBM2224A 12mm socket and 22/24mm offset wrenches. It seems like the head gaskets are giving folks fits, too. Mechanics are putting them on backwards which blocks the oil return on the front cylinder which leads to blowing the seals on the cams, leading to smoke and an oil bath of the engine and rear tire. And then either a red faced mechanic or a costly repair. My 916 had the regulator fail, which then also damaged the ECU and a coil. All were replaced and the regulator was the "updated" one. Upon closer inspection, I found that there is exposed insulation on the wires coming from the alternator, the connectors fit poorly and their insulation was cracked. The connector for the new regulator is already melted a little and stuck shut. I'll be replacing this whole mess with new wires and an Electrex regulator. Left side of the engine. Tons of wires and plumbing. Shocking to see after working on two valvers for so long. Right side of the motor. Where are the belts? Hell if I know. At least I found where the fuses are to pull out for track day! I think that heat shield is really to conduct heat to your right boot.